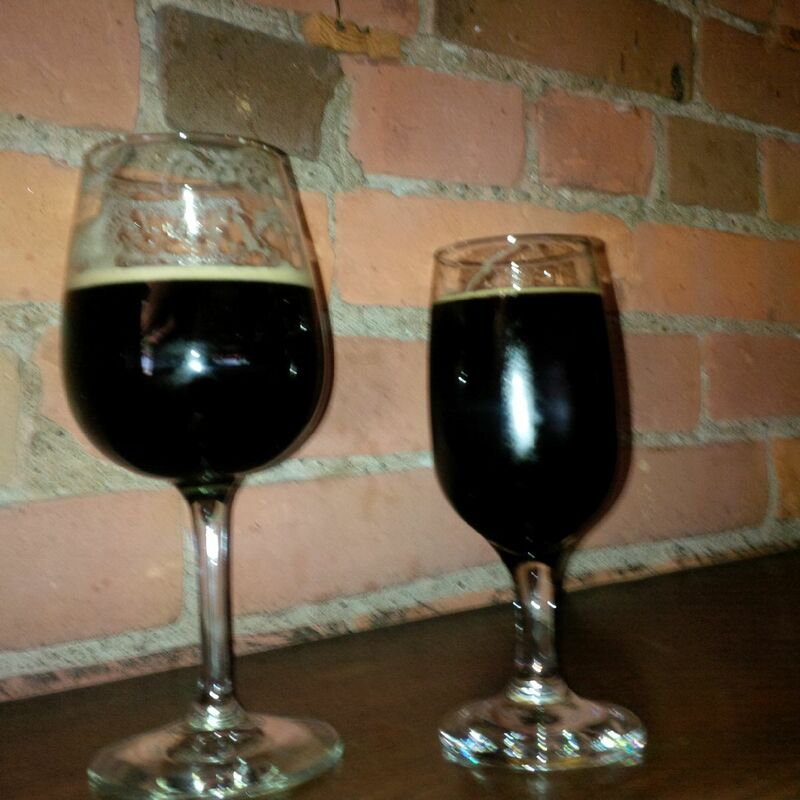 Pictured are the Lapatt Robuste Porter of Dunham Brewery in Quebec (à la gauche), and its incomparable La Petite Mort Imperial Stout aged in Armagnac, Cognac and brandy barrels. These were all I tasted today from the Dunhamian draft and bottled bacchanal at Bar Volo which was held on Saturday, as I was out of town. (A few beers are still available today; these are two). I also got down some very good American pale ale with an assertive New World hop taste but “even-flow” on the palate, it reminded me in a different way of the skill Stone Brewery in California has with pale ale/IPA. It is hard to overestimate how good the Impy stout was, a luscious rich glass of beer that spells strong porter perfection. It was equal to or better than Wells Young Courage Imperial Russian Stout, kind of a cross between that and Thornbridge’s imperial stout. I checked Ratebeer after forming my own conclusion, and it rings in at 99, which is no surprise at all but a testament to the good judgment of the Ratebeer crowd. The barrel residuums combined to magical effect with the dark malts, imparting a dark fruit note yet avoiding the crude oxidative notes so many barrel-aged beers have (a kind of “degraded vanilla” one might call it, although tastes vary in this area as most things concerned with the malt). The effect was like a fine estate dark chocolate dipped in some far out assemblage of old Madeira, old bourbon and scented brandies. The porter, in the contemporary Irish style, was worthy with the typical “burnt fresh grain” notes. Faced with the Olympian achievement of the impy, its vocation was more as chaser, which it acquitted very well. In general no one I met who attended the festival expressed anything less than awesomeness at the results. Gary, that Imperial Stout sounds positively delicious! Are beers aged in cognac, brandy, etc. barrels common? I don’t follow the beer world too closely, so am not up on these things. BTW, I’m really enjoying your blog. Joe, great to hear from you here. Imperial Stout, the strongest type of porter, originated in the heyday of porter in the 1700’s in London. Porter was frequently long-stored in wood, generally very large vats. Other forms of wood-storage were used including probably 36 gallon (U.K. measure) casks. The aged porter was also often mixed with fresh young porter to provide a balance of flavours. Aged porter would sometimes be winy and a little sour, fresh young beer would be rich and sweet and very bitter (bitterness wears off with time), so blending was often done. Some of the wood containers would previously have held wines or spirits (e.g. sherry pipes, which were 130 U.K. gallons). This is known for a certainty since at least one mid-1800’s brewing text advised to store porter for aging in butts that had previously held sherry (as you know, a wine mixed with brandy to strengthen and preserve it). The author wrote that if sherry-lees were apparent in the vessel, leave it in, all the better. In America, Goose Island in Chicago introduced AFAIK the first commercial bourbon barrel-aged stout, over 20 years ago. It became a thing. But as you see, the general idea is very old. In recent years, brewers have used all kinds of barrels to age strong porter or stout in, including barrels that previously held brandies of various kinds. If you look at the Dunham website under “beers”, they indicate the percentage of the beer aged in each type of barrel. My issue is many of the barrel-aged beers I’ve had have an oxidation taste I don’t like, a “sickly” taste, either that or they simply pick up too much of the coconut vanilla taste American oak typically imparts more gratefully to bourbon or Chardonnay, say (I suppose American brandy too). But many people enjoy these tastes, what is “correct” is always relative… Anyway the Dunham really got a perfect balance of flavours in the beer mentioned. I’d guess the beer wasn’t stored too long in the brandy barrels either, probably a good thing. By the way Dunham also makes a well-reputed bourbon barrel-aged Impy, it’s available in bottles, but I haven’t tried that one.